Governors' D.C. Summit Dominated By Medicaid And The Sequester : Shots - Health News Since the governors last met in July, some have shifted their views on the federal health care law. A few Republicans have even changed their minds about the potential benefits of the president's plan to expand Medicaid. Iowa Gov. 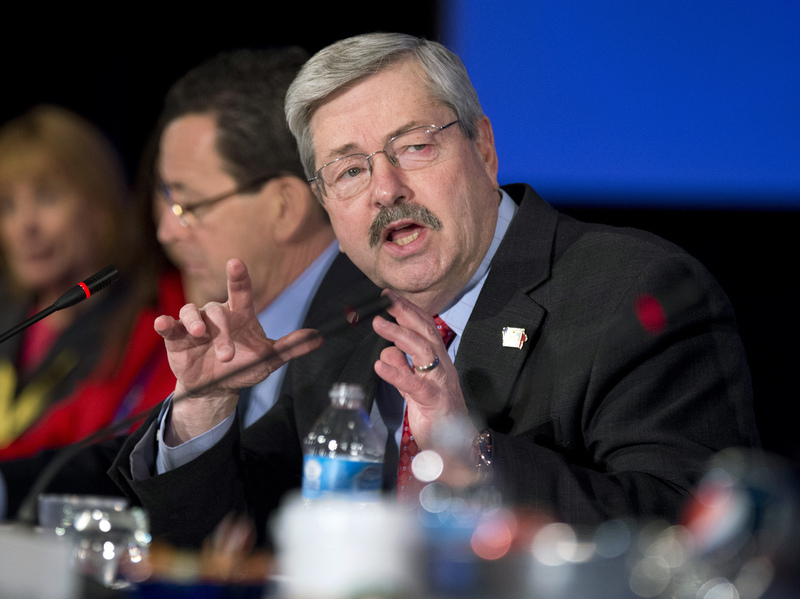 Terry Branstad speaks during a panel discussion at the National Governors Association 2013 Winter Meeting in Washington, D.C. When the nation's governors gathered in Washington, D.C., over the weekend for their annual winter meeting, the gathering's official theme was about efforts to hire people with disabilities. But out of the public eye, at the sessions for "governors only," the discussion reportedly was dominated by two more pressing issues of the day: whether or not to expand the Medicaid program as part of the Affordable Care Act; and the potential upcoming budget cuts set for the end of the week, known as the sequester. President Obama even used his meeting with the governors at the White House on Monday to do a little lobbying. "This morning, you received a report outlining exactly how these cuts will harm middle-class families in your states," he said, referring to a document released to the media Sunday night. "Thousands of teachers and educators will be laid off. Tens of thousands of parents will have to deal with finding child care for their children. Hundreds of thousands of Americans will lose access to primary care and preventive care, like flu vaccinations and cancer screenings." The president urged the governors to meet with their members of Congress while they are in Washington "and remind them in no uncertain terms exactly what is at stake and exactly who is at risk." Not all the governors, however, seemed convinced that the cuts would be such a terrible thing. "It's hard for me to believe that America's going to be devastated by the federal government cutting its budget 2 or 3 percent," said Gov. Dave Heineman, R-Neb. Rather, said Heineman, the president should consider taking a page from state executives' playbook. "He should do like every governor in the country," he said. "We bring our legislature together; we solve this in a responsible way. The president is not leading right now. He's engaged in scare tactics, and that's the wrong way to go." By contrast, the discussions over Medicaid, which had been highly partisan during the governors' meeting last summer in Williamsburg, Va., seemed to have taken on a far more conciliatory tone. "I said in Williamsburg, after this election's over, these governors, the Republican governors that are claiming the Affordable Care Act is the end of the world, are going to recognize that it's a way for them to grow jobs and economic opportunities by giving lower income and middle income Americans access to health care," said Gov. Peter Shumlin, D-Vt. "And you're seeing them come on board, one after another." Gov. C.L. "Butch" Otter, R-Idaho, said calling what's happening a shift in tone would be wrong. He said it's more a matter of playing the hand he's been dealt. "We tried in court," he said. "We tried at the polls for a new president; we tried for a new Senate. We lost on all those fronts. So now it's time for us to recognize that one of the most important tenets of a republican form of government is the rule of law." Idaho hasn't actually said yet if it will expand its Medicaid program — it's still negotiating with the Department of Health and Human Services. That was something else going on behind the scenes at the governors' meeting. HHS Secretary Kathleen Sebelius was meeting individually with governors to see what it would take to convince them to expand access to Medicaid. Under the law, the federal government has promised to pay 100 percent of the added Medicaid costs for the first three years, and at least 90 percent after that. "They got a lot of coffee and a lot of water upstairs, and I think they're meeting with almost every governor," said Otter, who wouldn't comment on the outcome of his own meeting with Sebelius. One thing that seems to be holding a lot of governors back from committing to the Medicaid expansion is the question of whether that money will really be there. "Because of the budget mess here in Washington," Gov. Terry Branstad, R-Iowa, predicted to Politico over the weekend, "we're going to see at some point here in the next couple years, some kind of grand deal that's going to massively reduce federal spending, and they're going to dump the cost on the states. That's what they always do in Washington." So far, only seven of the nation's 30 Republican governors have said they'll go ahead and expand Medicaid starting next year. But Gov. John Kitzhaber, D-Ore., says the most recent convert, Florida's Rick Scott, could change many more minds. "First of all, he's a prominent governor," Kitzhaber said. "But he was also a very prominent opponent of doing what he's now decided to do, and I think that gives other people permission." Indeed, even the Republicans who remain opposed to expanding Medicaid in their states are now being careful not to criticize their colleagues. "I think all the governors agree that each governor has to do what they think is in the best interest of their state," said Gov. Mary Fallin, R-Okla. "We're respectful of other people's opinions." And that may be the biggest change of all.